It has been a while since my last post — and may still be a few weeks before the next post. I have just moved house, so everything has been chaotic for a while, and will be for a while longer — because getting back up to speed on the activities that pay the bills (writing and speaking engagements) has been my highest priority. But once I dig out from all this, I’ll be back with more tales of my adventures in Australia. So stay tuned. I slept incredibly well in the wonderful brass bed in the comfortable guest room. The fragrance of a bouquet of freesia and grape hyacinth that Judy had placed in the room was a delightful welcome to consciousness. Judy and Geoff are great gardeners, and there are flowers everywhere outside, but also cut flowers throughout the house. The sky was overcast, but it was not raining, so we still had high hopes for the day. We had breakfast by the kitchen window, so we could watch the birds that gather here: crimson rosellas, magpies, gray currawongs, and a wattle bird. I love this place. 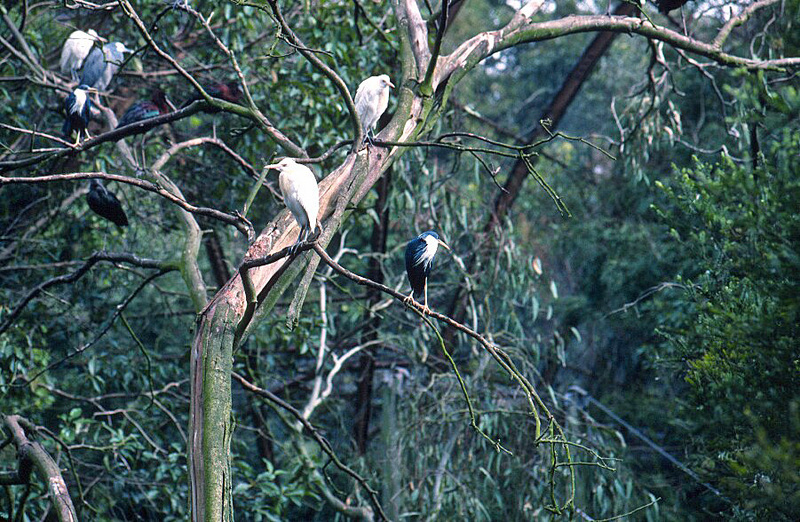 The sky began to clear, so we headed off to the Royal Melbourne Zoo. 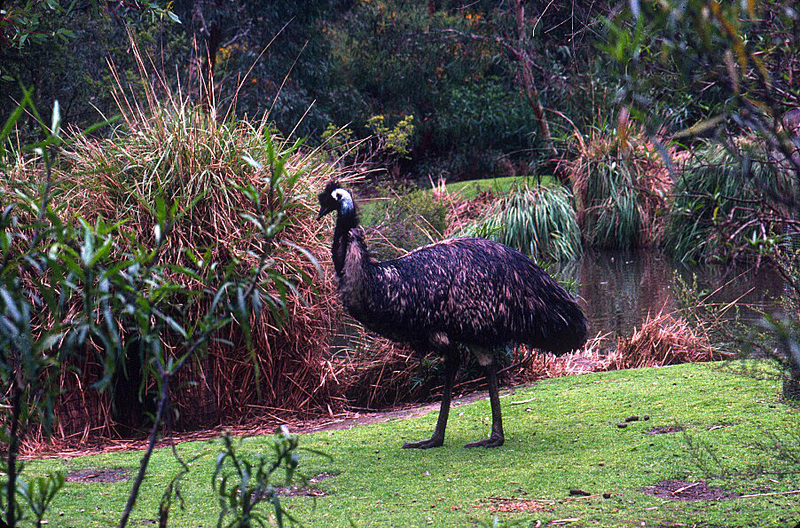 I had visited the Melbourne Zoo during my first trip to Australia, so I knew it was splendid, but it’s a fair drive from the ranch—almost all the way back to the airport. However, Judy and Geoff assured me that they were pleased to have a reason to visit, as they loved the zoo, too. So we were off. The day remained a bit gray and quite cool, but that didn’t keep us from having a wonderful time. The zoo was even better than I had remembered, plus there were things I hadn’t seen previously. I was again dazzled by the astonishing walk-through aviary. Since the weather suits the birds there, it isn’t even really enclosed, just netted at tree-top level. As a result, there is almost no feeling of separation between the vegetation outside and that inside the aviary—and the large number of wild birds that gather nearby help bolster that feeling. Just astonishing, the variety and beauty of birds from all over Australia, swooping and perching and dining and preening their feathers and wading and showing off. Big day for things with wings, as the butterfly house was next. I was ecstatic. There is something so ephemeral and ethereal about butterflies, it is a bit like touching a rainbow or a piece of sky. The numbers of butterflies made their beauty even more overwhelming. They were fluttering everywhere, some landing on me, many perching on the flowers that crowed around us, others dancing together. I was almost giddy with delight. Judy and Geoff are keen on Aussie animals, so they were as happy as I was in the exhibits of local fauna. I have seen all these animals in the wild, but I never get tired of them. 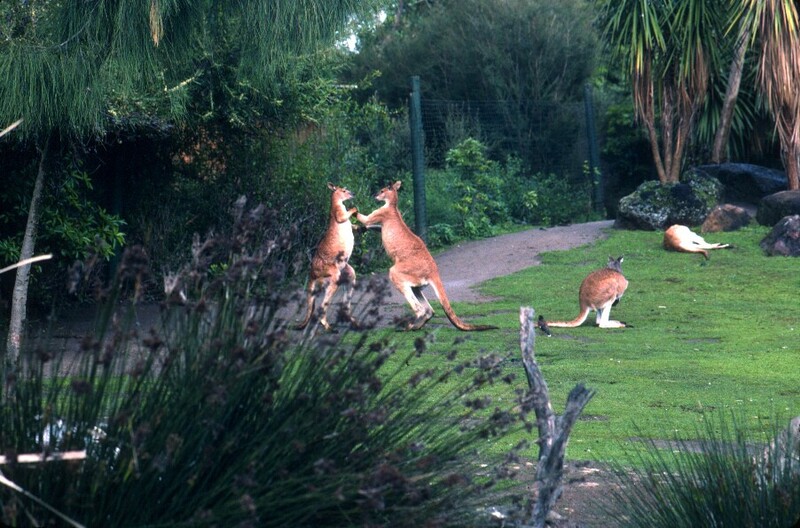 One behavior I hadn’t seen before (other than in videos) was kangaroos boxing. It’s likely the ones we saw were just practicing for the mating season, but these creatures can really fight when it comes time to divide up the ladies. 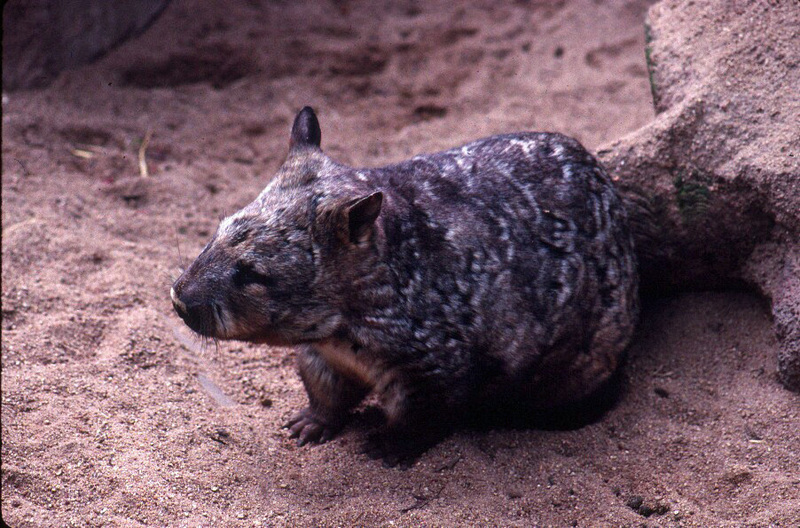 Emus (birds, but not in the aviary as they are flightless) and a southern hairy-nosed wombat posed nicely for my photos. We also fit in some African and South American fauna. It’s too big a zoo to see everything, but we did our best, staying until closing time. Then back to the mountains. We missed most of the traffic, so we got back to the ranch in just over an hour. Geoff built up a fire in the fireplace, Judy made tea, and we relaxed for a while before Judy started dinner. We then spent an amiable evening, talking about Australia and books, Judy’s horses and endurance riding and her and Geoff’s road rallies. It was a lovely evening. But then it was time for bed, as we have an early start tomorrow. Leisurely morning–not up until 8:00. Because it was my last meal in their home, at least for this trip, Nikki and Richard created a really splendid breakfast and served it out on the terrace, so we could take advantage of the lovely weather. Then it was time to pack. Richard loaded my bag in the car, and we were off to Adelaide. Richard and Nikki had a few things they wanted to do in town, but Richard also had a couple of things he wanted me to experienced, things I had missed on previous visits to Adelaide. I happily left the day’s plans to him. We did a bit of shopping along the pedestrian mall section of Rundle Street, where cafés and eateries appear to outnumber boutiques. No one really wanted to rush around, so after Nikki bought a few things she needed, we just ordered tea, settled at an empty table, just talked for a while. After having their carefully made plans go so terribly wrong, Nikki and Richard had been fairly stressed, but today, they were unwinding at last. Also, with Richard no longer in his outback guide role, he could relax. The conversation was both stimulating and light-hearted–and it would make it that much harder to leave. But Richard still had those two things he wanted me to experience, and it was several hours before we had to be at the airport. First stop was the Adelaide O-Bahn, a “guided busway.” Buses pull onto the O-Bahn, and then, like a train, they are guided by the tracks. This takes buses out of city traffic, as cars can’t go on the tracks. No stop lights or competing traffic. No holding up cars when the bus stops. Nifty. We took a bus for the 12-kilometer/7.5-mile ride up the Torrens Gorge. 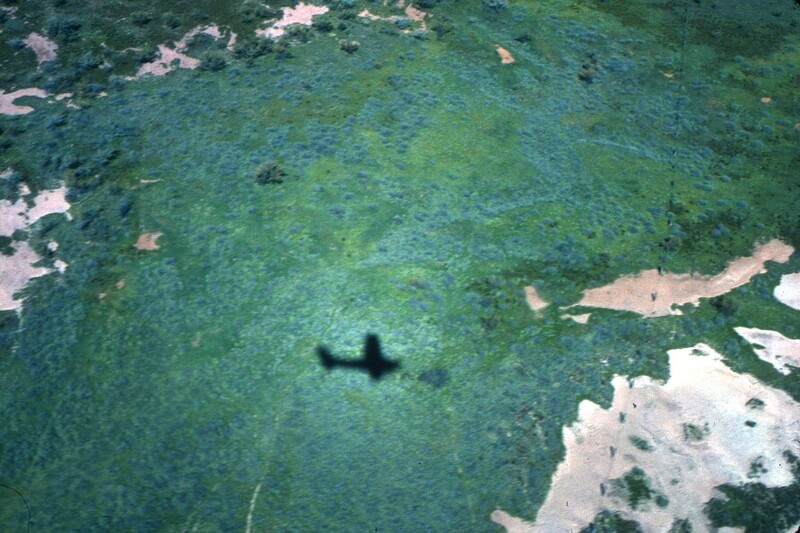 Transit was smooth, swift, and safe, and the surroundings were beautifully landscaped. The bus simply pulls off when it reaches one of the stops along the route, and then pulls back on. Really brilliant concept. 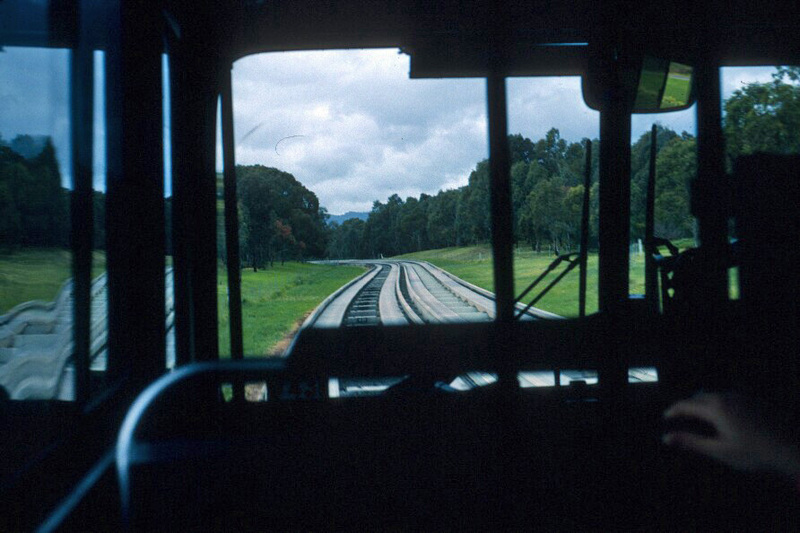 However, since our purpose was just using the O-Bahn, we didn’t disembark; we simply returned to our starting point. For lunch, we enjoyed Indian food and more excellent conversation. Then we headed over to Victoria Square. I had seen the Glenelg Tram on my first visit, but just witnessed it stopping here at the square. This time, we would ride it. 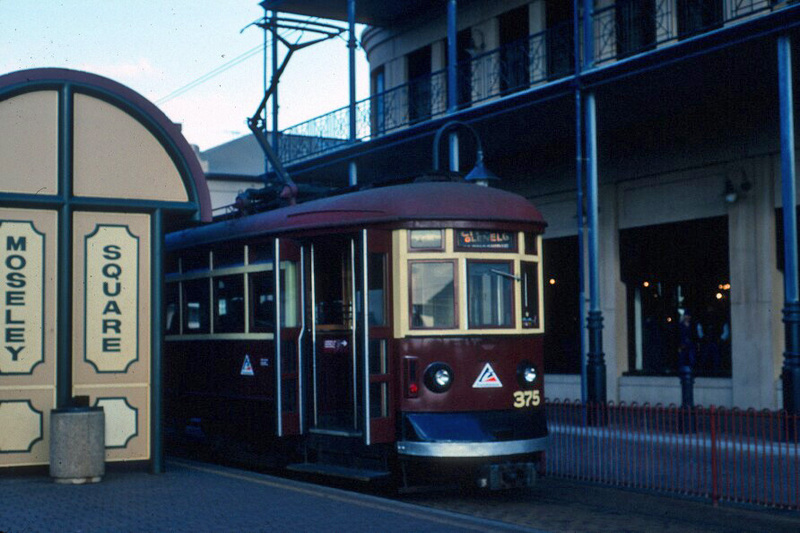 The tram is a classic electric tram—the last one in Adelaide. The interior is old fashioned and handsome, with abundant brass and wood and leather trim. The tram runs the 15 kilometers/9.3 miles from Adelaide city center to the Victorian-era, beachside town of Glenelg. The tram carried us through a trendy part of town into old suburbs, then to vintage rural areas to the seaside in a few minutes. But no time to linger in Glenelg. We had to return to Adelaide, get the car, and head for the airport. As we drove out of the city, I wondered why I felt so much less like I was in Australia here than I did out bush. 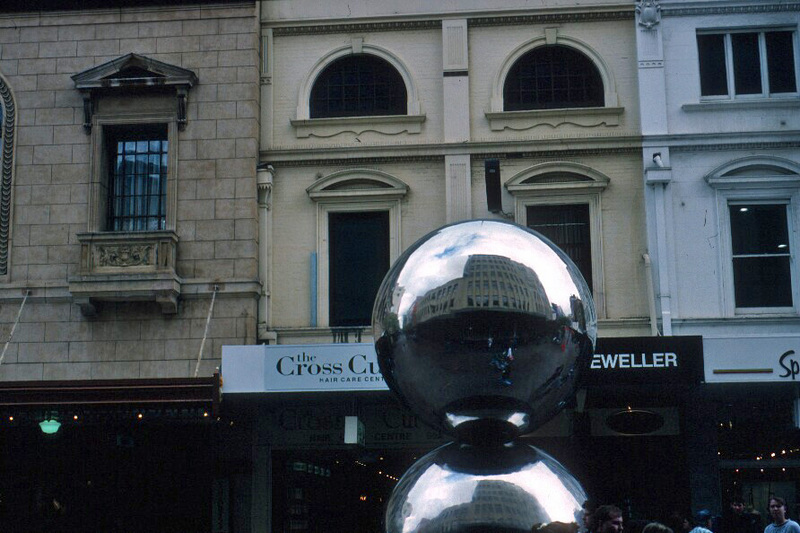 I love Australian cities, and Adelaide is a delightful place. But it’s the wild places that cling to my heart. Maybe it’s because cities are so much a part of “real life” that they don’t offer me the sense of escape that the outback does. I do realize I couldn’t live in the wilderness, but I do love the rugged beauty–and being truly “unplugged.” That said, I was quite happy with the things we’d done today. Nikki and Richard came into the airport with me, and I bought coffee and tea, and we sat and chatted until it was time for me to head out to the boarding area. I left them hoping I’d see them again, and maybe even have new adventures. I feel blessed to have such friends. The flight was bumpy but otherwise uneventful. It was raining as we landed in Melbourne. Judy and Geoff were waiting for me at the airport. They look great; semi-retirement clearly suits them. They had gotten a new Land Rover since my last visit, though they assured me the one I knew was still at the house, reserved for hauling supplies for the horses and garden. We wound through Melbourne’s suburbs and out and up into the Dandenong Mountains, arriving at their lovely mountainside ranch at roughly 10:30 p.m. The three of us enjoyed a cup of tea and talked about what we’ll do this week. Then I headed off to their delightful guestroom with its regally high brass bed. It’s good to be here again. The weather was beautiful, the sky was clear, and it was, again, a lovely drive. 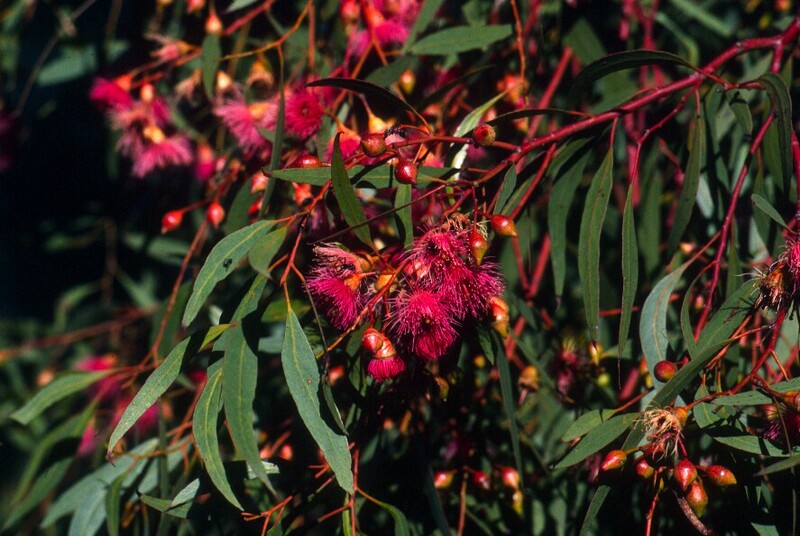 Galahs, eagles, corellas, crows, ruins, flowering gum trees, mistletoe, sheep, horses, an ostrich farm. Always something to see. 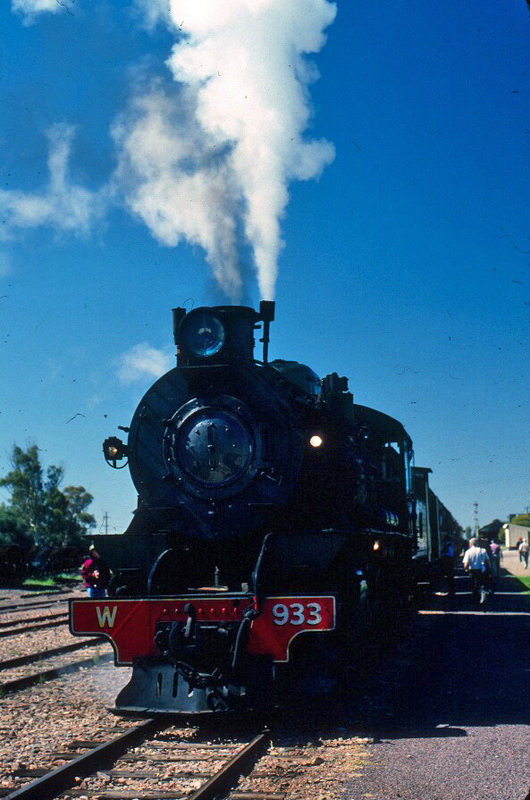 Arriving in Quorn, we spent some time admiring the handsome, antique steam train that would take us on our tour. 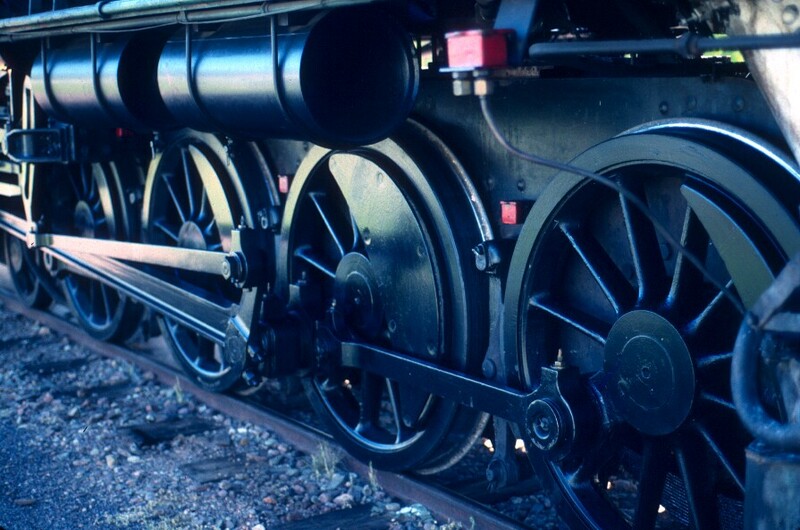 There is something evocative about its appearance and even more so about the sounds—the hiss of the steam brakes, the chuff, chuff, chuff of the engine. This is an important train-preservation location, so most of the people here are real enthusiasts—and those running the operations, from engineers to conductors to ticket sellers, are all volunteers. The train was full, so they put us in the guard’s van, the car in which guards and break men traveled, in order to have a good view of any problems that might occur on the train. The open half-doors on both sides actually gave us a better view than the windows in the passenger cars. And we were off on a brilliant one-hour ride to Woolshed Flat that took us through fields of wildflowers and among rolling hills. 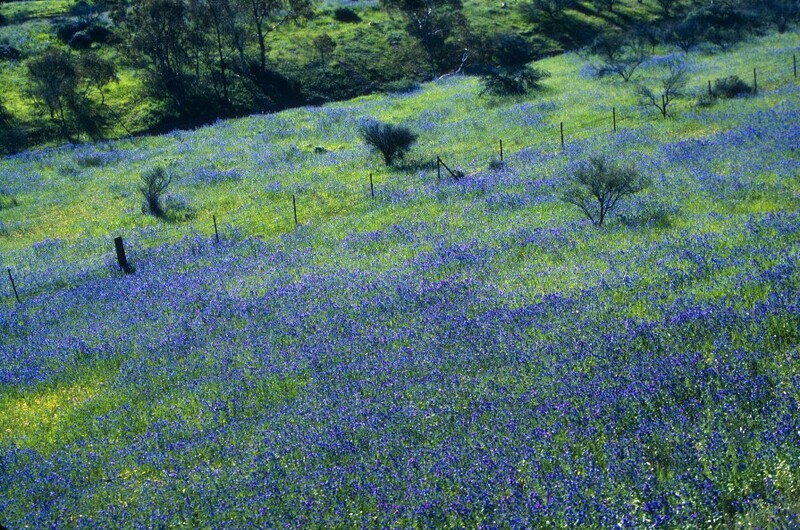 The conductor said that, if I’d seen the movie Gallipoli (I have), I might recognize some of the countryside. 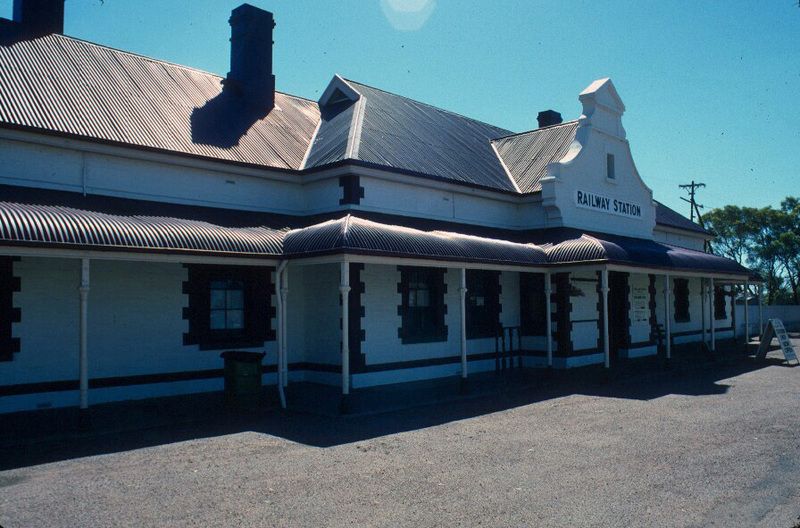 I already knew from my last trip that Quorn, especially its train station, had appeared in Gallipoli, as well as numerous other Australian films, but learned that Pichi Richi Pass and parts of the Flinders Ranges also appeared in the movie. And then it was time to head for home. However, Richard took us by back roads, rather than the highway—more inland, and more scenic. Saw a few new places and some familiar from previous trips, and loved it all. 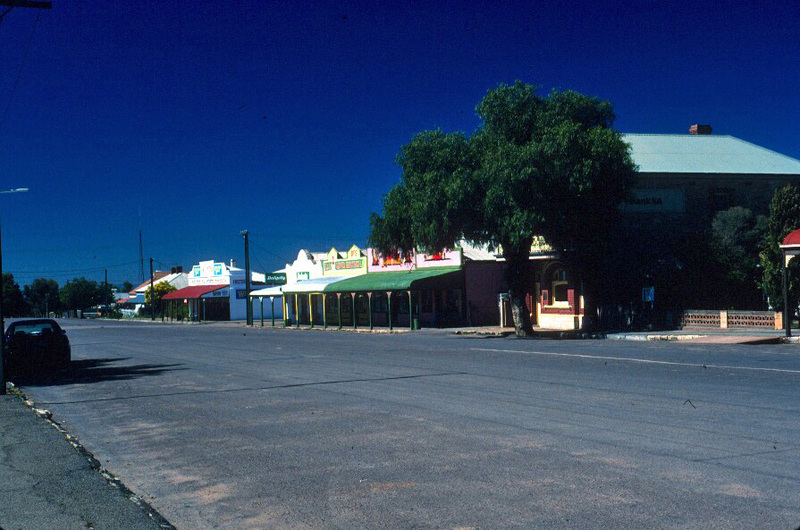 Wilmington, Melrose (still lovely and charming, with old, well-kept buildings and massive river red gums), Murray Town, Wirrabara, Stone Hut, Laura (boyhood home of C.J. Dennis), and Gladstone—the point at which, at the beginning of our trip, we had turned toward Port Pirie. 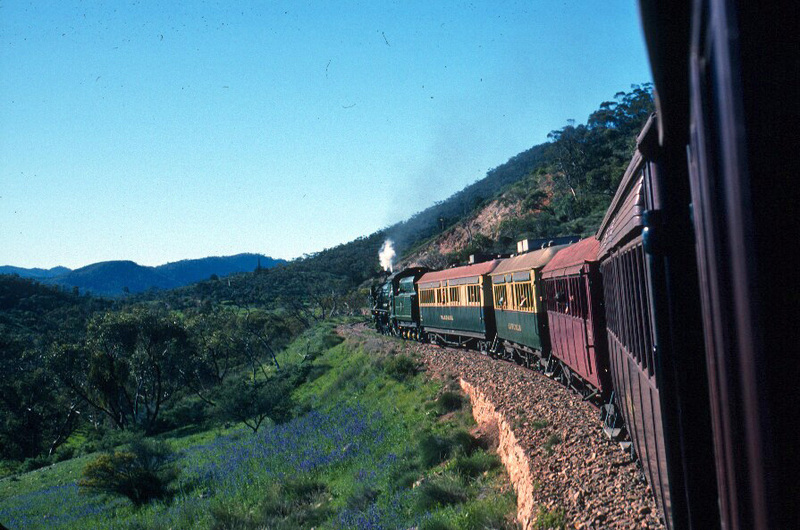 Charming old railway town, with wonderful Victorian hotels and train station. Through Georgetown, not stopping this time, retracing the beginning of our little trip. We enjoyed an amazing moonrise—full moon hanging, huge and yellow, on the horizon. Into Clare just before 7:00 p.m. We stopped for dinner at Bentley’s Bistro, in the wonderful, old, 1865 Bentley Hotel. Enjoyed our meal, but didn’t linger, as we still were an hour and a half away from the Barossa Valley. Pulled into Richard and Nikki’s driveway after 9:00 and quickly unpacked the ute. Then we relaxed for a while, chatting, and looking at books about Australia, until we could stay awake no longer. After a good night’s sleep (beds are not a bad thing), we started the day with a good breakfast while watching the financial news. 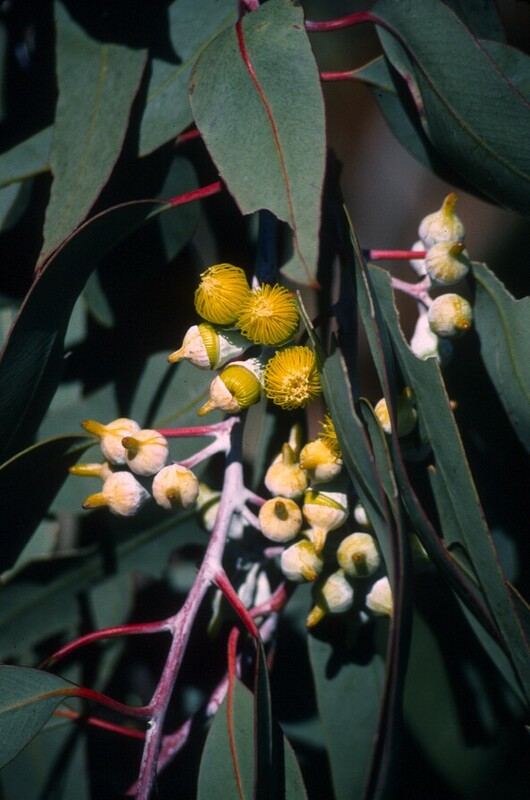 When we stopped outside, I dashed off to take a couple of photos–gum trees (eucalypts) blossoming–because even here, there is wonderful beauty. Then we packed the ute and headed out into the day. First stop was the Australian Arid Lands Botanic Garden. 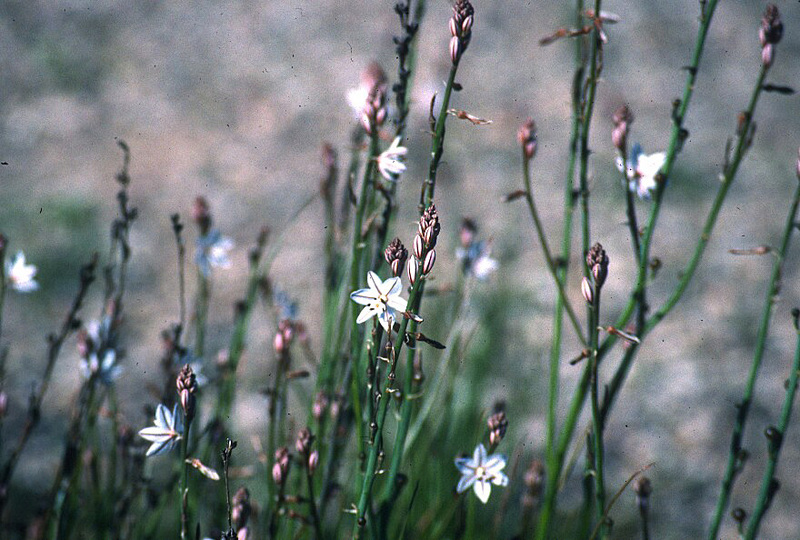 Here, they showcase the plants that are ideally suited to climates like this one (green now, but most of the year is dry). They also encourage people to landscape with plants that do well in arid regions, to conserve water while still being surrounded by beauty. We stopped next to check on the trailer and get an estimate for when Richard can expect to get it back. 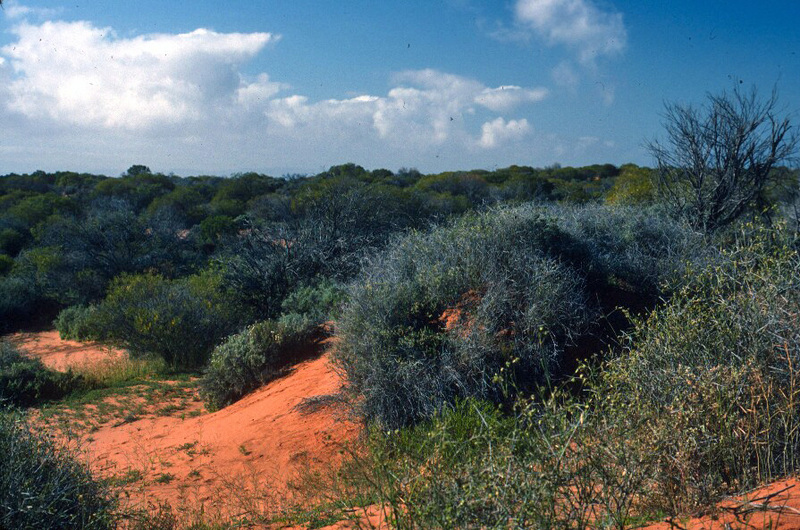 Next, to the Wadlata Outback Center, a fascinating information center and tourist attraction that uses displays, videos, models, and slide shows to relate the history of the Outback. It covers Aboriginal Dreamtime, the geological history of the continent and region, explorations and explorers (Giles, Eyre, Sturt, and Stuart), homesteading, wool, wheat, disaster, plants and wildlife, the pedal radio, the School of the Air, the Flying Doctor Service, the Birdsville postman, trade, trains, and life in the huge iron-, gold-, and uranium-mining communities. Delightful museum. 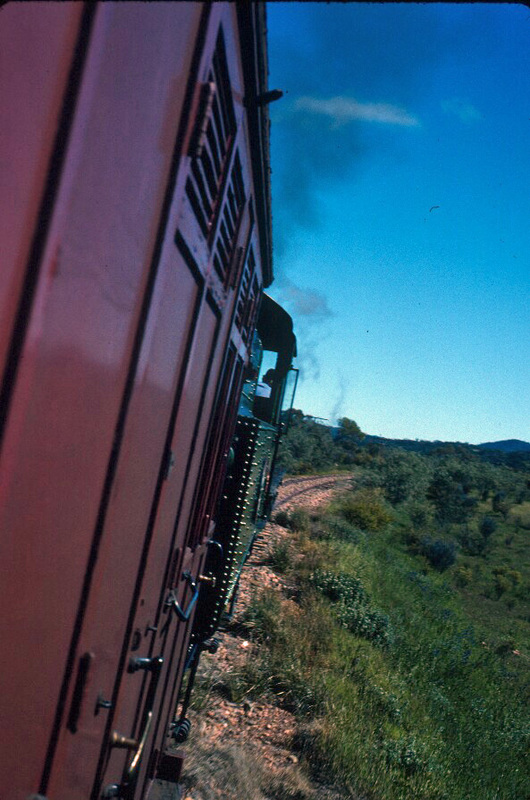 Then on the road to Quorn, to catch our ride on the Pichi Richi railway. 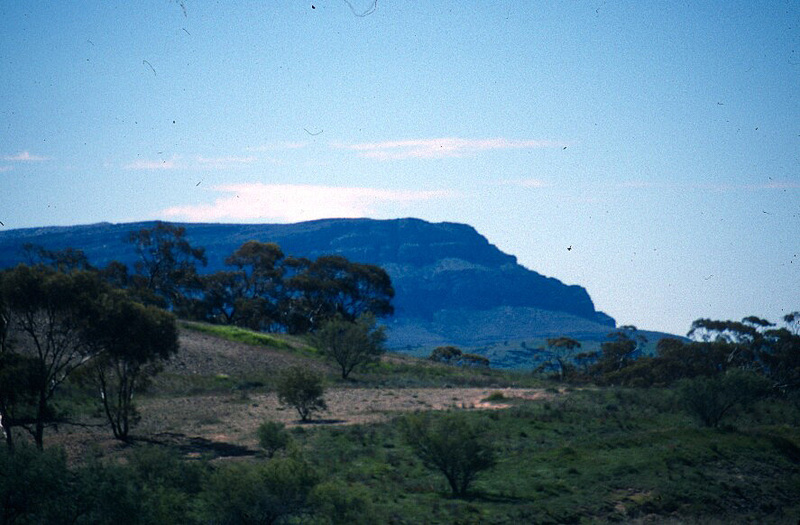 We continued on into the Flinders Ranges National Park, past Rawnsley Bluff, the leading edge of Wilpena Pound. 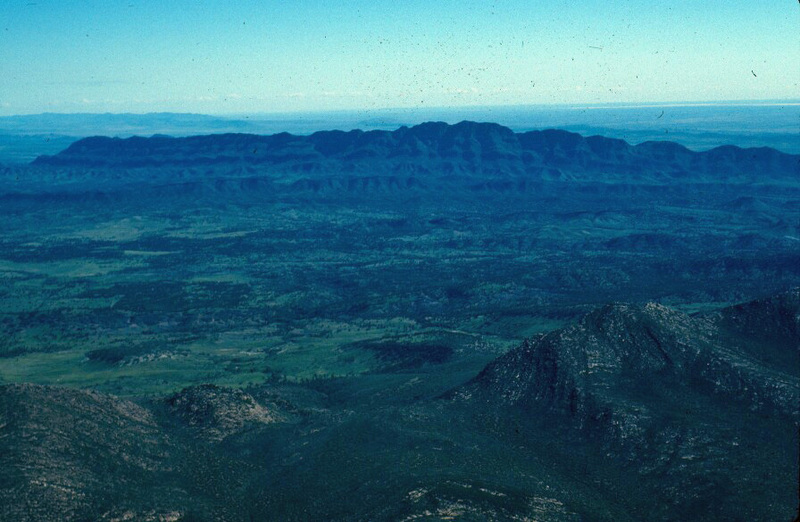 Wilpena Pound (aka Ikara) is a natural amphitheater of mountains in the heart of the Flinders Ranges. 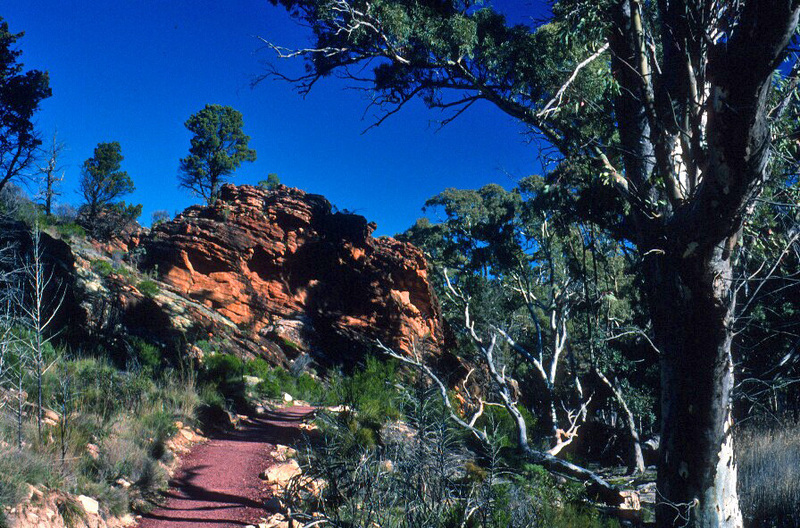 The entire area, but especially Wilpena Pound, are famous for both geological history and remarkable beauty. Driving along the hills of Arkaba, Richard pointed out trees he thought I might not know: Callitris, aka Australian native pine or cypress-pine. It’s evergreen and coniferous, but not actually a true pine tree. I’d seen the handsome trees before, but it was nice to have a name to attach to them. Richard stopped near Arkaba Creek, and we had a picnic lunch in the dry creek bed, shaded by huge old river red gums. 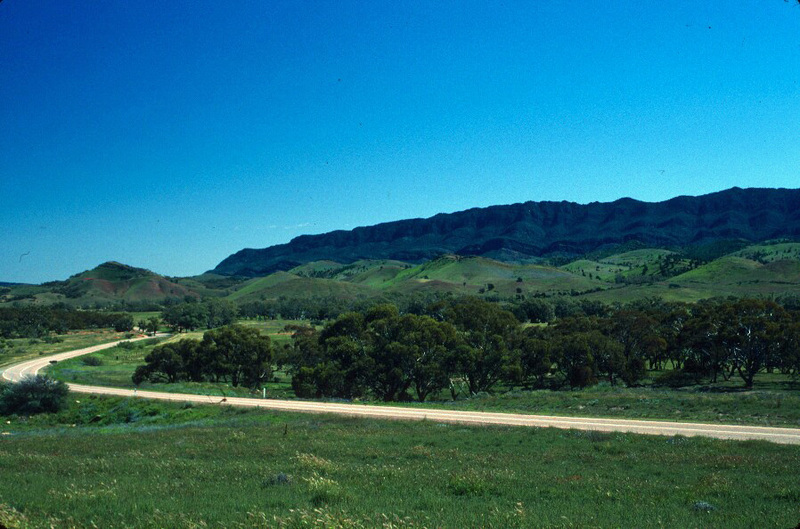 Then on the road again, headed for a small landing strip where 20-minute scenic flights over Wilpena Pound are offered. The little, single-engine plane had room for four, so Nikki, Richard, and I joined the pilot and taxied down the short, dusty runway. It was a mixed experience for me. The scenery was spectacular. 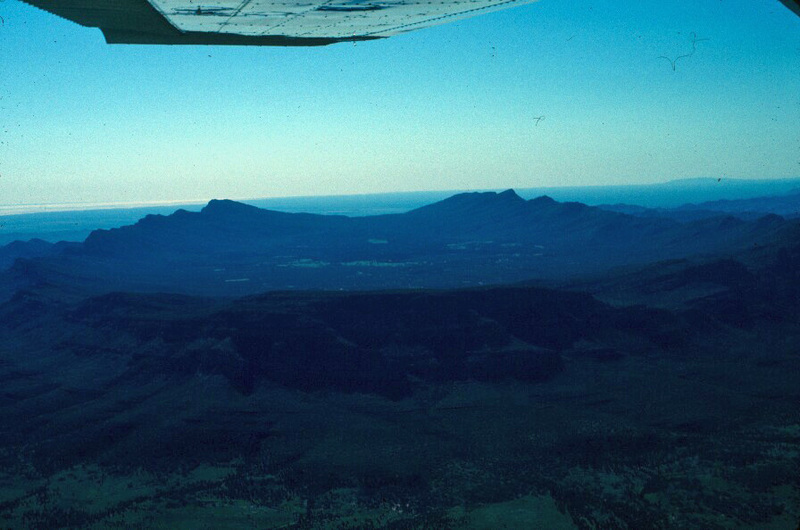 The formation of Wilpena Pound is best seen from the air, and I got some great shots of the Pound, but the combination of thermals, wind, mountains, and a small plane made for a wildly lurching flight. Fortunately, I discovered that I could hold the airsickness bag with one hand and still take photographs with the other. But changing lenses was out of the question. After we were back down and I was more or less recovered, we drove into the pound. Beyond glorious. Greenery and wildflowers blanketed the “bowl” formed by the mountains, running up the stone walls that surrounded us. 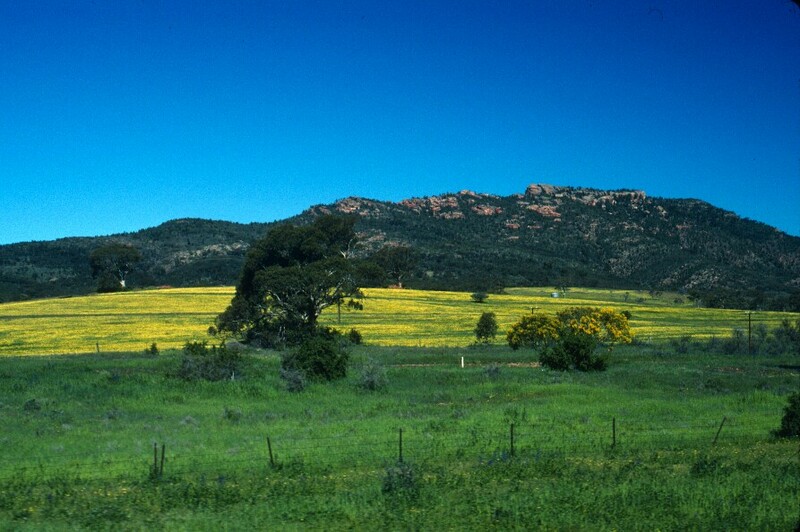 (The Flinders Ranges are, in fact, famous for their abundant wildflowers.) This time of year, the greenery softened the outlines of the astonishing geological structure. Richard stayed near the ute, to plan the rest of our trip (he’s been here many, many times), and Nikki and I headed off to explore the “bowl.” First stop was to study the sign of where the hiking trails might lead us. 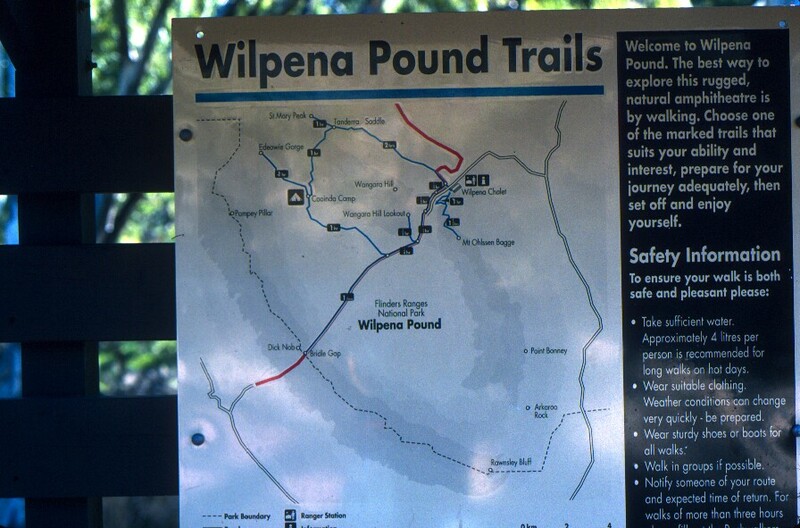 We hiked for about 20 minutes along Wilpena Creek, enjoying the beauty of our surroundings. 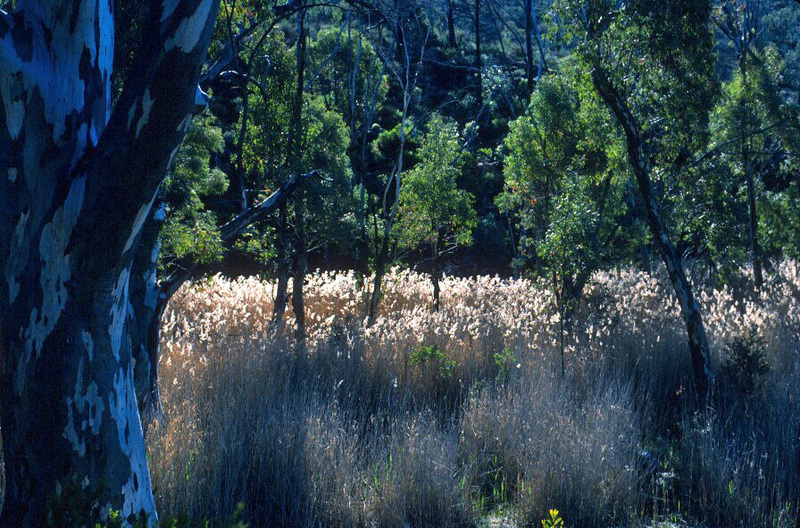 The sunlight was brilliant, and in one spot, made the tall grasses look like they were glowing. 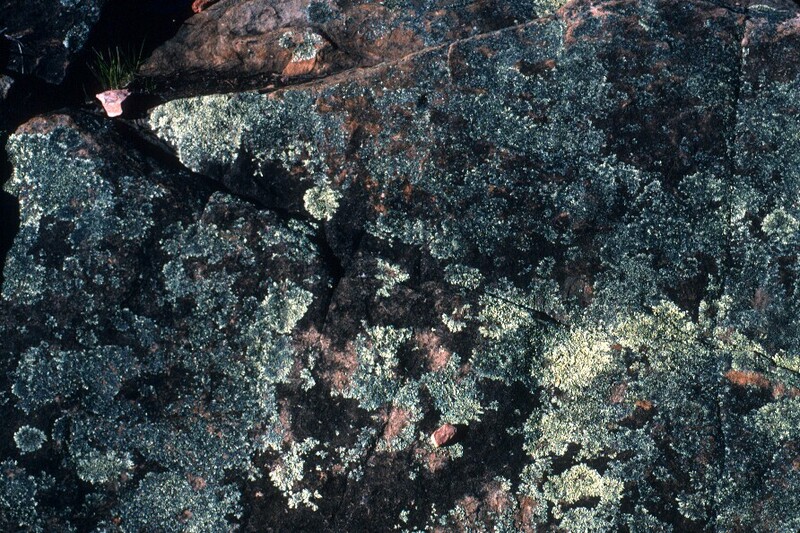 I took photos of trees and rocks and flowers–and even of lichens growing on rocks, because I like lichens. They grow in places where it seems unlikely anything would grow. But we couldn’t help but notice that the shadows were getting longer, so we headed back to where Richard was waiting. Getting back to Port Augusta before dark seemed like a good idea. The changing vistas as we drove back across plains and through mountain passes were spectacular, especially with the lowering sun making everything warm and magic. Reached the cabin just before sunset and started right away on preparing dinner: spaghetti Bolognese. Richard turned on the TV, as he and Nikki are great gardeners and figured, since we weren’t sleeping in tents, they might as well catch their favorite gardening show. What made the show a bit more special is that the gardens being shown were in Mount Tom Price, in Western Australia, which Nikki and I visited together on my first trip to Australia, before she ever met Richard. Not as wild and rugged as originally planned, but still a splendid day. We’ve decided to stay where we are, since it’s a nice little cabin and quite near the Flinders Ranges. But first things first. After a hearty breakfast, we jumped in the ute, took our damaged trailer to the repair shop, and spent a couple of hours immersed in insurance forms (though I was just there for moral support—Nikki and Richard did all the work). But that out of the way, we headed for the mountains. We drove across the Willochra Plain, passing the Kanyaka ruins, which we visited on my list trip. 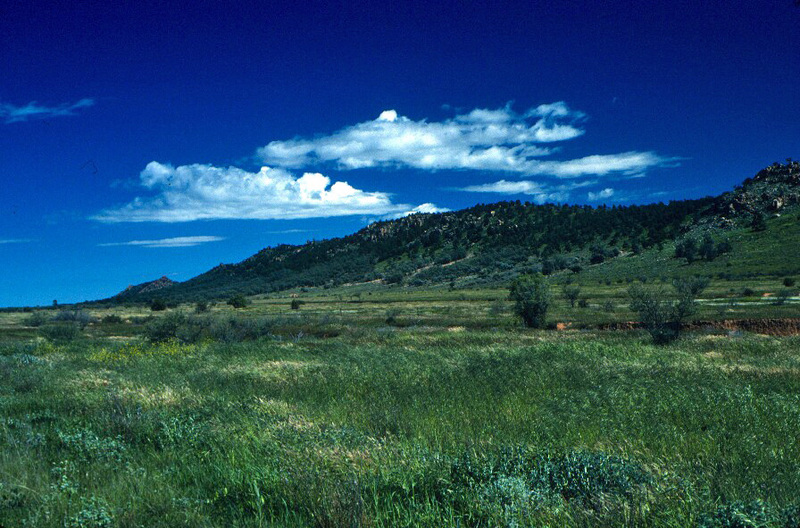 Showing nothing of the harshness that led to the ruins, the plain today was very green, with orange, yellow, purple, and white wildflowers running riot over the rolling terrain. Birds were everywhere, not just here but throughout the day: galahs, corellas, kites, eagles, kestrels, magpies, Port Lincoln parrots, and more.